This pattern was designed to introduce basic cabling techniques in a playful variety of stitch patterns. Each section can be worked until mastered before moving on. The cables will flow into one another beautifully regardless of the exact number of repeats. 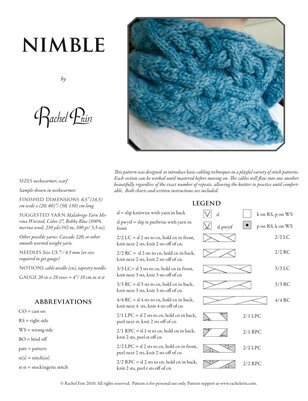 Once the basics are mastered the knitter is free to mix and match cables of the same stitch count. This pattern would also work as an introduction to charting, as both charts and written instructions are included. The charts gradually increase in length and complexity, allowing the knitter to practice different chart reading methods.